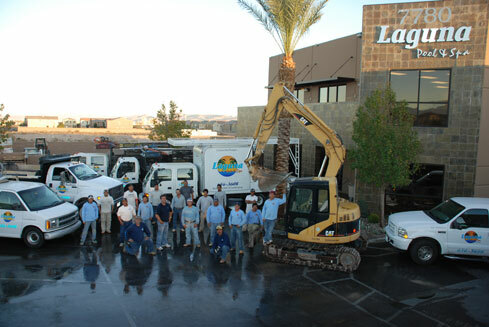 Family owned and operated for over two decades, Laguna Pool & Spa has been building some of Southern Nevada’s most innovative pools and unique outdoor living environments. We take pride in the fact that we have the capabilities to plan, design and construct your new pool, spa, water feature, fire element, barbecue and landscape or recreate an existing one with a limited use of sub-contractors from conception to completion. Laguna’s experienced professionals, dedication to quality workmanship and personal attention to detail ensure we exceed our client’s expectations. The result is an outdoor space reflective of your lifestyle and taste that will increase the value of your home and provide your family recreation, relaxation and enjoyment for years to come. So take the plunge! Call Laguna Pool & Spa at 702-656-3608 today for a free on-site consultation and let us show you how easy it is to make your personal paradise a reality.